Doing the social media stuff that I do, I see a lot of cat-related stuff; your cute cat thing has to be pretty darn good to impress me. MouseAir cuts it. 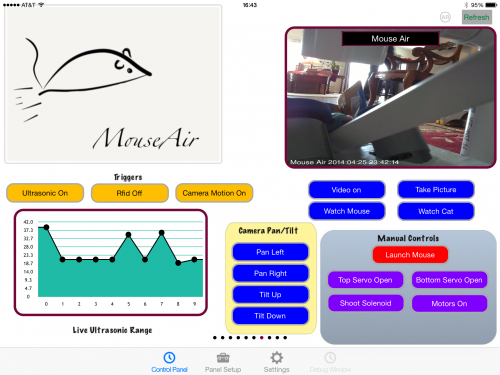 I came across MouseAir in Raspberry Pi’s Google+ community, where project author John Shovic of SwitchDoc Labs has been posting regular updates. John’s cat, Panther, enjoys playing with toy mice, but tends to lose them under the fridge; John decided to automate the supply of toy mice to make sure that Panther is never without entertainment, even when no one else is at home. His goal was to detect the cat and fire a furry toy mouse into the hallway. He thought of Raspberry Pi. 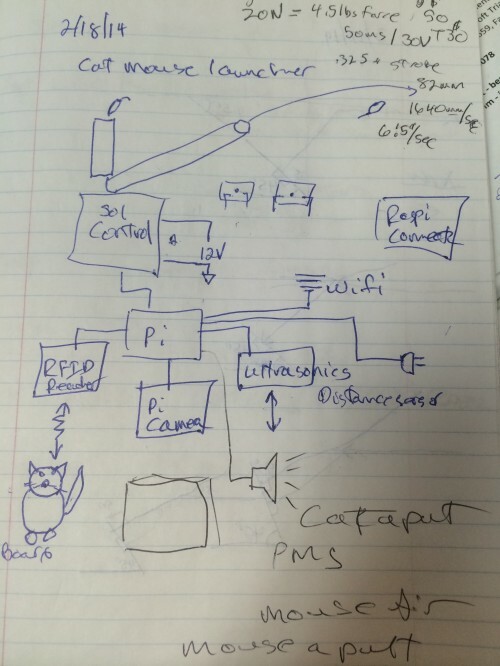 He began with a block diagram, drawn in a pub. The launching system was quickly prototyped. 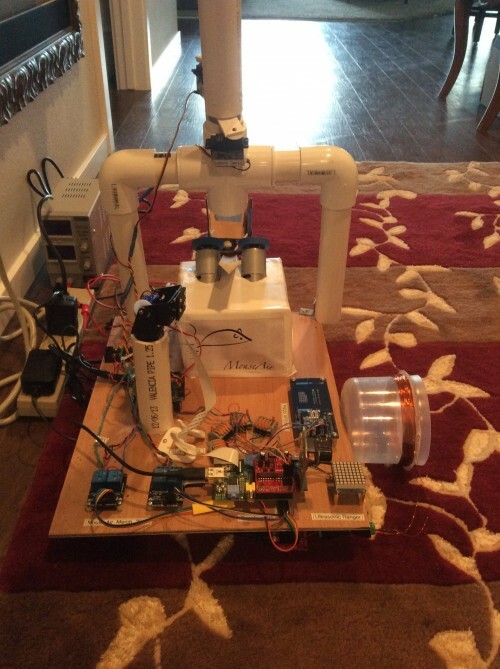 It uses a 12V solenoid switch, intended to push up the door lock buttons on a car, to nudge the mouse between two quickly rotating 12V brushless motors, which launch it into the air. A Raspberry Pi handles the sequencing. “Maybe we could tone down the motors a bit”, muses John. But MouseAir is much more than just a launcher. As well as RFID detection of Panther’s tag (with a hand-built antenna) and ultrasonic detection, there’s a Raspberry Pi Camera Module on a pan/tilt base for capturing still images at critical moments, examining the launcher for jams, detecting motion and streaming video. Happily there’s a system diagram to help us keep track of all this. More custom code sits between RasPiConnect and the MouseAir main code, and John writes that we can expect an article about how the control system is constructed in the June or July 2014 issue of The MagPi magazine. He has also written up the whole project for Issue 5 of Raspberry Pi Geek magazine. You can take a look at all the MouseAir posts on the SwitchDoc site. Mind you, I’m starting to feel uncomfortably as though our own cat – snoring behind me as I type, despairing of ever seeing an airborne toy mouse, still less an automated one – is getting something of a raw deal. Substitute a sharpened dart with the mouse and you’ve got yourself a anti-personnel cannon. Burglars beware. These days I do feel like Wallace. Helen, I posted a new blogpost showing a picture of the cat, mouse and the cat’s biggest fan. With two little Yorkies in our family, and a large back garden covered in neighbours-cat-poo, the very thought of rapidly whirring motors and airborne ‘visitors’ has my mind more than a little bit intrigued. In fact, I’m sitting here smiling as images of Homer and Bartm, trying to survive in the wild, manage to launch their dinner into the next county. Perhaps this wonderful project could be adapted ? Very cool. I hope he will extend this project with face recognition for the cat so it can be stopped at the cat door if it has a mouse in the mouth. That is anyway my own wish project number 1. I hope the ultrasonic detector is high enough not to annoy the cat. Or will [s]he simply take out the extra agression on the toy mice? (as Afferbeck Lauder)… Air mice poster sayit? Mass distraction for a swarm/bevy of cats, Much distraction for one.